This was the first attempt at cooking anything Italian for me and was a great learning experience. I mixed all the above ingredients and portioned into ~2 oz meatballs and placed into the oven at 425F for about 19 minutes. The Meatballs turned out great except for the amount of moisture in the chicken was too much. I rinsed the freshly grounded meat, and it seems I did not fully drain the water from the meat. This caused the meatballs to flatten out during the cooking process and because more of meat discs rather than balls. 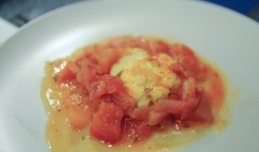 I followed the recipe shown in the video for the class for the most part except for the tomato portion. I did not have tomato paste / canned tomato, and I like using fresh ingredients so I used 4 roma tomatoes, cut into larger chunks. Another change from the class recipe was using white wine instead of water to add to the sauce - I have seen this used in a few different recipes Ive read online, and decided to give it a shot. The end result was a marinara with a sweeter taste from the tomato and the wine, but still leaves the slight taste of heat from the chilli flakes in the end. I was not sure how to get the thick marinara that I see out in restaurants etc, but I think that is from using the canned tomato rather than only fresh. My sauce turned out a bit more chunky with the tomatoes. Overall a great experience with my first attempt, and I think the second try would yield much better results since I know where I can make adjustmets.